I can't say that I've ever seen a classic mash-up like this, and I'm really digging the results. 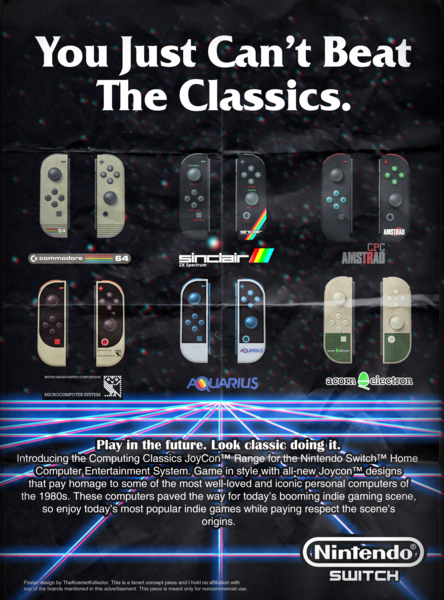 Ever wonder what the Switch Joy-Con would look like with designs/color schemes that hearken back to classic computers? Artist TheKosmicKollector did, which is why he answered the question himself. I don't know about you, but I'd pay a pretty penny for that ZX Spectrum design! That Sinclair pair looks amazing. I recently stumbled upon one at a garage sale. It still works very well unfortunately all the software is counterfeit I guess it was a lot easier back then. The Commodore 64 design is what I&apos;d go for. I&apos;d also be up for the C64 design. Though it looks like it might be one of the earlier case variants with the casing of a VIC-20. Not that I&apos;m being extremely picky about it, as someone who had and has a brown case with a rainbow badge. Only other thing I could think of is a C64C colour scheme. 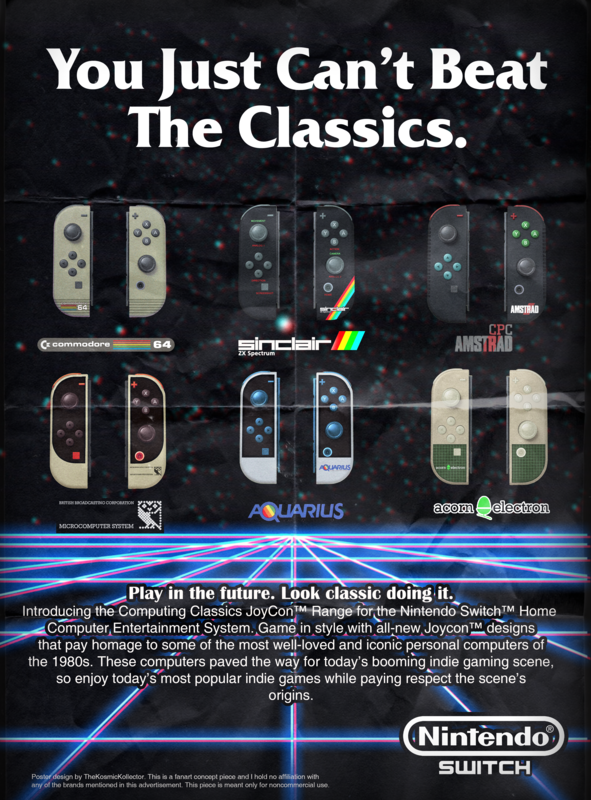 I&apos;m just curious what a few other computer and console theme based controllers would look like. Just need an Atari 8-bit computer as well if going to start going back. Given the basic grey set of controllers already available kind of reminds me of a TI-99/4a as well. None of them are computers I&apos;ve owned, but they look great... Even better if they had D-pads. I&apos;d love to see an Amiga variation.